"This is a very easy and yummy vegetable side dish to make!!" Place squash in a shallow baking pan, cut side down. Bake in preheated oven for 30 minutes, or until tender. Turn cut side up; season with salt and pepper, dot with butter and sprinkle with brown sugar and cinnamon. Not something that I would ever make again. Certainly nothing special about it. Very yummy for something different! I think next time I'll use a little less butter as the squash didn't soak it all up and it ended up leaking out into the pan and burning. acorn squash is wonderful! for this recipe i simply baked the squash plain and then added a couple tablespoons of earth balance and agave nectar! yum! 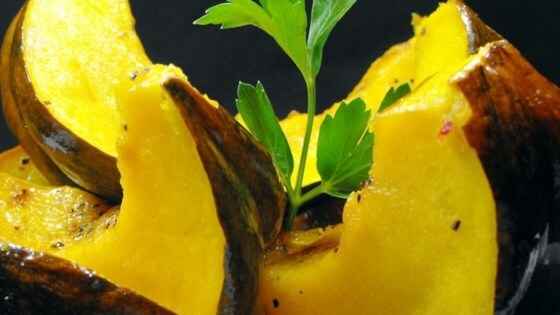 mmmmm, this acorn squash dish is very tasty! made as directed except i basted the squash with the melted butter half way through the second baking stage. many thanks corwynn! This was ummmm ummmm good! I used a little more brown sugar than the recipe called for to soak up the butter and it turned out just perfect. My whole family loved it, even my six year old!! The only way to eat any kind of winter squash! I do prefer to leave the cinnamon out though. The quantity of butter is too large! Delicious!